Michael Carless once again broke the the TAG Light lap record, this time it was at the 2016 Class Titles. Please note that the track will be closed on Monday December 12 2016. Formula SAE will be using the track. November means Class Titles time at Oakleigh and a number of determined souls gathered on a mild Saturday morning to see who would take the spoils. The report is brief because I was also busy looking after flags and I should also note that all results here are provisional – they are the order the karts crossed the finish line, but are to be confirmed. Michael Carless took all before him in the Heats of Light, winning both, with Jack Scanlan and Daniel Griffin sharing a pair of seconds. In Heavy Richard Matera had an easy time of it with Anthony Lantouris suffering a DNF in Heat 1 and not starting Heat 2. In the Pre Final it was Carless yet again, Griffin then Rory Spencer and Scanlan behind him, James Barnes going out with a DNF. Oakleigh’s Southern City Classic got underway on a sunny Sunday morning as Melbourne began to get into spring weather in earnest with a hot 31 degrees forecast – the first warm weather racing we had seen for some time. Showers and thunderstorms were also forecast for later in the day which might liven things up towards the end, but as the morning rolled on we ran qualifying and then got into the heats. There will be a working bee this Saturday, November 12 2016 from 9 am – 12 pm. The track will be closed during this time. Please come along and and give your club a hand. The club committee has now given you two more reasons to race at the Southern City Classic on November 20 2016. The reasons – there will be two $500 random prize draws conducted at the event, which any competitor has the chance to win. You must be in attendance at the draw, or a redraw will take place. The track will be open all day on Saturday November 19 2016 for anyone wishing to practise for this event. Full event details and supplementary regulations are available on the race entry page. Please take the time to pre-enter for the event. The Club Championship points for 2016 have been tallied and are available for download. These are the final standings for the year as the upcoming class titles event is not a championship round. Congratulations to the winners in their respective classes. 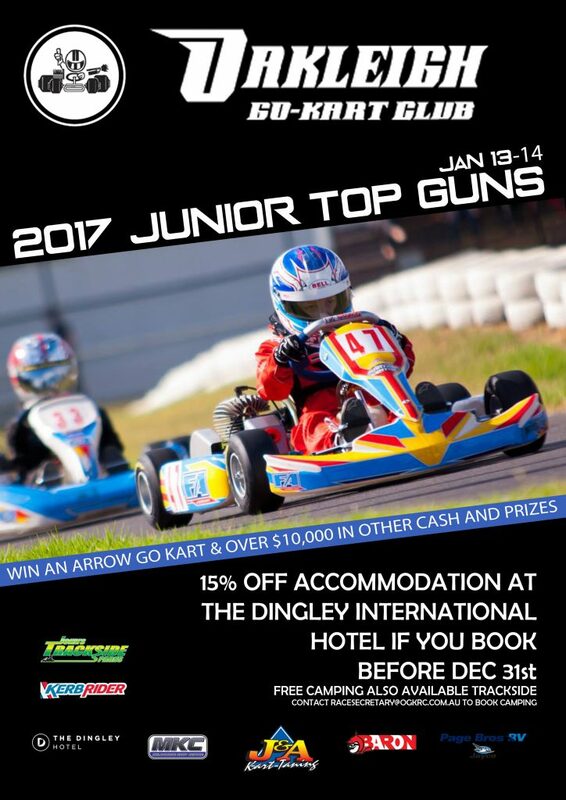 The next Oakleigh Go Kart Racing Club (OGKRC) General Meeting will be held on Tuesday November 8 2016 at 7:30pm in the Clubrooms. If you wish to have anything included on the Agenda please contact David Bell (president@ogkrc.com.au) as soon as possible. General Meetings are open to all OGKRC members and as members you are entitled to put forward any issues/views/concerns that you believe need to be discussed. You will also hear from other members and the Committee about things that have/will be happening around your Club. There will be opportunity to bring up other items on the night when we get to the General Business section of the night but if you know of something please let us know in advance.